Most homeowners who have a cedar roof don't realize until too late that they should have been taking better care of the roof over their head. 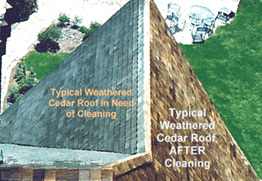 Unlike asphalt, asbestos, or slate roofs, cedar can be cleaned and preserved adding many years of life to the roof. Cedar Roof- Before and After pressure cleaning and preserving a cedar roof can dramatically change the visual appearance. However proper care must be used regarding water pressure and detergent selection so not to damage the roof. Too much water pressure may loosen shingles and drive contaminants deeper into the wood; not enough pressure may not effectively remove the damaging contaminants. The presence of a bleaching agent in the detergent when washing natural cedar will change the color of the cedar instead of cleaning it. In the same way you should not bleach a dark article of clothing because it will change it's color, we would not bleach a cedar roof destroying its' golden brown natural color. Unfortunately we cannot keep your roof looking like new forever. Within a couple of years the cedar will start turning gray again and go through its' natural aging process. "Peace of mind" will come from knowing that your newly cleaned roof will enjoy protection against further rain and sun damage that will last many years. The safety aspect of completing a job like this should also be noted. Our trained and certified personnel can safely complete the job using ladders, roof hooks, ropes, life lines, body harnesses, and aerial boom lifts when needed. An inexperienced person should never attempt to scale a roof for pressure cleaning. It takes many years of on the job practice to completely master the safety issues of climbing on a wood roof. In sum, spending the money to have your cedar roof preserved every five to ten years will save you the cost of prematurely replacing a section of your entire roof. As anyone whose paid for a new cedar roof knows, this is an extremely expensive job.